Messages : 25 I have a dock on the bottom of the screen. I'm not using the expanding icon effect, nor the auto-hide. When selecting an icon in the dock, by placing the mouse pointer on it, a tool tip naming the icon appears above the icon. This is fine, but if you move the mouse pointer into the tool tip (so it is outside the dock), and then move the mouse horizontally, parallel to the dock, successive icons get selected, even though the mouse is just outside the dock/panel area. This makes it difficult to manipulate any desktop or window items that are just above the dock. If you accidentally point at a dock icon, you have to move the mouse well away from the tool tip to avoid the dock, and then back again to get at the desktop item (while carefully avoiding selecting the dock icon again). So I suggest that the active mouse area is confined to that area within the dock, and not to extend to the tool tips. Even better, make the active mouse area slightly smaller than the height of the dock (this is what Windows does). The same idea may also be applicable to expanding icons. I am not sure if this is a user problem or a feature request! 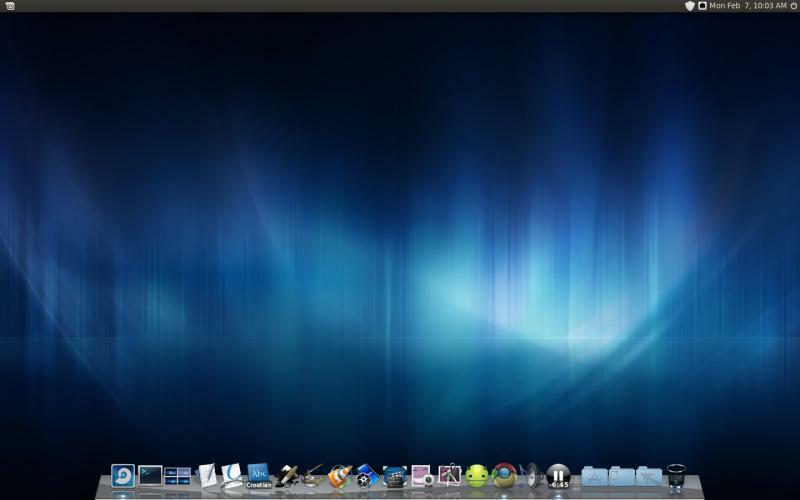 In my view Glx-Dock has become the best alternative to gnome3-shell and Unity. I expect you will be gaining many converts! you will still have to point outside of the icons (with the zoom). so ok we would gain some pixels, but maybe not as much as you would expect. But the real problem is that if you have sub-docks, you won't be able to enter it, because they point above the label. this is actually done in the "Panel" view. I think if you test this view, it will act as you want. I'll think of a way to place sub-docks adn then resize the active area. Messages : 25 Yes,I can confirm that in panel view, I do indeed get the behaviour I want (I was using the default dock view). Also, as a bonus, right-clicking anywhere in the panel always gives me the cairo menu pop-up, whereas using the default view for the dock, I usually get the pop-up relating to the desktop underneath (nautilus). I actually quite like the panel view. It nicely separates the different groups of icons. If it could be given a nice shiny 3D view style, that would be even better. The only issue is that I can't arrange the clock icon and taskbar in quite the way I'd like, but that's covered elsewhere in the forum. The only issue is that I can't arrange the clock icon and taskbar in quite the way I'd like, but that's covered elsewhere in the forum. do you have some idea about that ? there is not a lot of room in this view. However, you could draw it the same way as a 3D dock is drawn, with the difference that the space around and above the icons is still part of the panel, but transparent. I don't mind a 3D view like that being hosted in a panel that is ~40 pixels high, seeing as I don't use any other panel to take up desktop space. All you would be doing is painting the panel a different way. (My panel icons are cuurently sized at 36 pixels, and they look good). also, I think it's important to keep the size of the panel view quite small (even if it would be an option). Still, the only reason I'm using panel mode right now is because of some small user interface issues in the other views, which I know are on your to-do list. (for example, active mouse area, and features that would allow more control over where icons get placed, e.g. the task bar).